Lasagna consists of several layers of wide ribbon pasta spaced by layers of savory filling made of meat, cheese, vegetables or seafood. 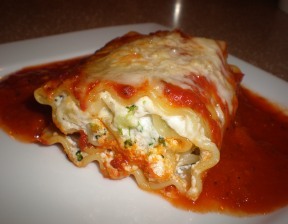 Favorite sauces for lasagna are usually tomato, bechamel, or a combination of both. All of the following recipes can be made with either dried or homemade pasta, unless otherwise noted in the recipe. A classic Italian lasagna layered with ground beef, ricotta, and mozzarella cheese, and baked with a traditional tomato sauce. A rich and creamy lasagna filled with shrimp, scallops,and crab. It's a wonderful special occasion dish. 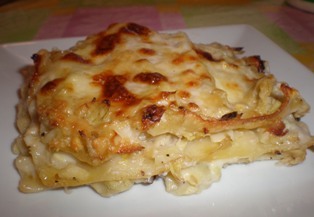 This lasagna has artichokes and cheese in a creamy bechamel sauce. 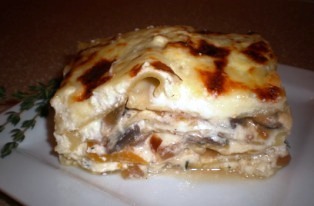 Butternut squash and mushrooms are combined in this very hearty lasagna that is a perfect dish for Thanksgiving or as a vegetarian main course. 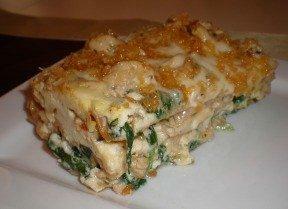 This lasagna is layered with chicken, spinach, ricotta and Alfredo Sauce and topped with crunchy Panko bread crumbs. 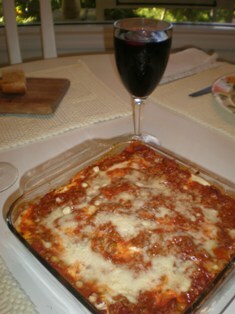 This lasagna is made with little meatballs (polpettine), sausage, and various cheeses and is served for Carnevale. cheese and spinach filling rolled in pasta. This classic Italian recipe from Emilia-Romagna combines layers of fresh spinach pasta with the creamy texture of bechamel, and the rich, meaty flavor of Bolognese sauce. 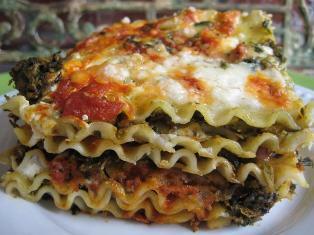 A delicious and easy recipe when you don't need or want a huge tray of lasagna. 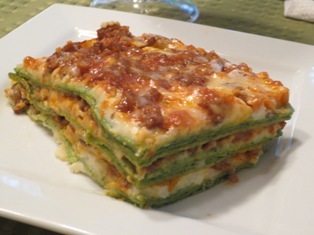 A twist on traditonal meat lasagna, this recipe is made with ground turkey with goat cheese added to the cheese filling. You don't have to use whole wheat pasta but it does give the dish a little more texture than regular wheat pasta. The ultimate in hot or cold (or hot and cold) food transport. This insulated carrier has a large main compartment and an expandable top compartment that are designed to accommodate most 9" x 13" baking dishes. The Trio Pan has 3 separate channels making it easy to serve vegetarians and carnivores from one pan. 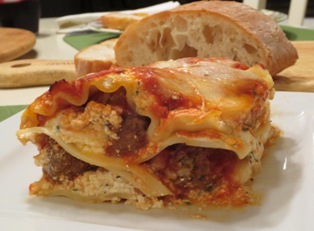 The width and length of each channel is the same as standard lasagna noodles, making lasagna building fast and easy. Make three dinners in one batch - tonight's dinner and two for future nights or for those unexpected guests. Loaded with garden favorites, this Roasted Vegetable Lasagna is a vegetable lover's dream! 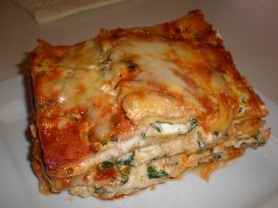 The spinach lasagna layers are generously filled with roasted artichokes, mushrooms, zucchini, peppers and onions. Enhanced with a parmesan and garlic ricotta cheese blend and tomato sauce, you'll love this twist on an Italian classic. Shrimp, scallops and crabmeat are layered with a white cheese sauce and a 3-cheese ricotta mixture to create a luscious rich and creamy lasagna.